Ok. Its good to know what someone is doing, but when is too much…too much? And what happens when what he or she is saying is not particularly that insightful? When it comes to the schlemiel, there is a limit. Every good writer knows that. Overkill doesn’t do the schlemiel well. This is what I fail to see in the Gary Shteyngart’s ad campaign to promote his work. The content of this endless series of faux pas – inside of interviews, a film trailer, the pages of memoir that he sent to the New York Times, endless praise in this or that newspaper, where we see the ironic little immigrant failure foregrounded – is too obvious and cliche. It is overplayed and it actually reduces the schlemiel character to the endless repetition of bad jokes. To be sure, I turn to literature so I don’t have to see all the schlemiel characters that Will Farell, Seth Rogen, and Ben Stiller do so well. I don’t want to find Hollywood in a schlemiel novel (or a schlemiel memoir). And I don’t want to hear the a self-congratulatory and slightly snarky tone that I so often find on the pages of New York Magazine. When I see all of this, I realize what I don’t like. What I want to see is a schlemiel that is far from New York Hipsterdom and Hollywood comedy. And I have recently found this in the pages of Bernard Malamud’s novel A New Life. What I discovered is that, not too long ago, the American schlemiel was a character who, though comic, was trying to seriously start a “new life.” Shteyngart mimes this process in much of his work. The life that his characters live or end off with in nearly every novel is, as I pointed out elsewhere “normal” or else lived in yearning of returning to New York. The end is lacking believability because the characters are either too normal or too ridiculous in their life. In Malamud’s A New Life, the main character Levin is much more believable. His schlemiel character touches deep on the life of the male American Jew. The failures of Levin are not too caricatured. They feel like real failures. 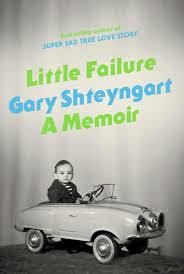 In taking himself as his subject, Shteyngart’s failures are caricatured. They are truly silly. Though animated, they are about as interesting as the next article on your facebook feed. A recent cartoon interview with Shtyengart is a case in point. Inside the little clown was an angry kid trying to get out. Had I been bigger I would have been some kind of bully. Thank God for my tiny frame. What we are left with is a Jew whose body limits his inner anger. He doesn’t have the frame to be a man. The joke is obvious and it makes the Jewish body into a pathetic site of failure. What’s lost in all this is Levin, Malamud’s schlemiel. When I think of Levin, I don’t think of his body. I think in terms of his desire for something better than what he has experienced in his life. He is a schlemiel because the life he ends up with is new but not in the way he expected. He often makes the wrong choices, but not always. He is not a pathetic failure, nor does he endlessly play on failure. Levin seems to be on, but he’s just a little off. Nonetheless, he does have some minor triumphs. And these are meaningful. The treatment of failure in American life (for a Jew) is much more believable, humbling, and meaningful. Malamud’s schlemiel is someone who I can identify with: his failures, real enough, hit on something common to many American Jews – even I, who was born from a different generation than Malamud, find something more resonant in his schlemiels (something that really is about being a Jew and being a failure). Shteyngart is my age. We come from the same time, but we come from different countries. And, more importantly, we have a different understanding of the schlemiel. Though I have spent a lot of time writing on his work, I always felt that this treatment of the Jewish-American schlemiel was missing something. I couldn’t identify with his schlemiels as I could with Roth, Bellow, or Malamud’s. In Levin, Herzog, and Portnoy there is a serious engagement with the link between an American, a Jew, and a schlemiel. Their schlemiels have given me insight into how Jewish schlemiels are locked into different identity-crises: one’s that matter. The fact that the Jews survives this crisis while at the same time failing gives a deeper shade to the meaning of failure. Shteyngart’s interviews and ads do the opposite. In fact, watching them, I feel as if the schlemiel becomes more and more clichéd and empty. Failure loses all of its content. When did we ever settle for this? What does it mean that Random House thinks that we can no longer live through the schlemiel like we used to? When did they decide that the schlemiel was utterly meaningless by way of infinite repetition and non-variation? So, when is too much, too much? When is the praise of the “Little Failure” too much? What we have with this repetition of a certain kind of schlemiel….is the exhaustion of failure….